We present an application of spatial-temporal prediction to track algal blooms. Algal bloom is an important water quality events in marine, coastal and estuarine environments. For a day, we first identify an area with anomalous algal growth represented by spatial points in the gridded data where values of Chlorophyll-a (indicator for algal bloom) are above a threshold chosen by domain scientists. To represent the shape of the algal bloom area, we create convex hull from spatial gridded points. We then find the radii from centroid of the convex hull. 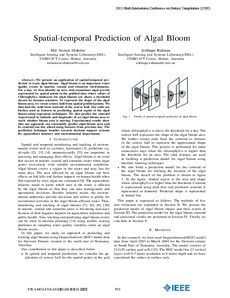 The radii are further used as features in predicting spatial region of the algal bloom using regression techniques. We also predict the centroid (represented in latitude and longitude) of an algal bloom area to track whether bloom area is moving. Experimental results show that our approach can reasonably predict algal bloom area and its centroid one day ahead using features from previous day. The prediction technique benefits towards decision support systems for aquaculture industry and environmental departments.